OHIO -- Police said a dog was shot after it attacked a man walking to work and then went after a police officer. 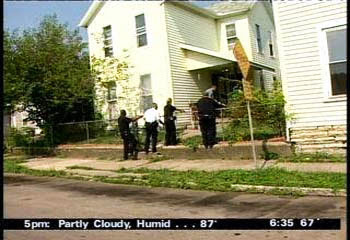 The incident happened Monday on Hawker Street in Dayton. The man said two dogs cornered him and started to bite him. He said he then ran into a house. When officers arrived, one of the dogs jumped at the officer. Police said the officer shot the dog, but it did not get injured. The man attacked was taken to a local hospital to be checked out. The officer was not injured. Police said the dog’s owner faces charges in the attacks. 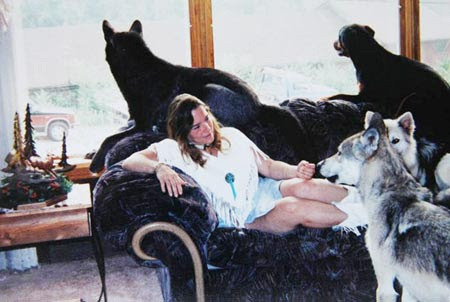 PENNSYLVANIA -- Sandra L. Piovesan bled to death after being mauled by a pack of nine wolf dogs that she had raised as pets and was so devoted to that she once told a neighbor they "give me unqualified love." Ms. Piovesan, 50, of Salem, was found Monday morning in a caged rectangular enclosure in her backyard, home for nine half-wolves, half-dogs that were later euthanized. The autopsy, performed by Dr. Cyril H. Wecht, found that the Westmoreland County woman suffered multiple soft tissue injuries. The nine hybrid animals are among the thousands that are known, depending on who is talking, by some variation of the terms wolf dog or wolf hybrid. Ms. Piovesan was not a member of the United States American Wolfdog Association, which purports to be the largest organization to register the animals. "I live here in Washington (Pa.) and I never heard of her," said John Davis, vice president of the organization. He declined to say how many members belong to his organization, though he said there are five filing cabinets full of breeding records on dogs and puppies whose bloodlines go back at least four generations. "We do not breed wolves to dogs. We breed American wolf dogs to American wolf dogs," Mr. Davis said. The breed got its start by mating wolves with dogs -- generally Alaskan malamutes, German shepherds and Siberian huskies. The American Wolfdog Association seeks to keep track of the dogs that are bred and works to improve the breed, Mr. Davis said, by requiring obedience training and hip-testing of dogs that are registered. The association holds dog shows and events in which members compete. "We raise dogs," Mr. Davis said. "All dogs have descended from wolves." Dogs and wolves will breed, even without human intervention, because wolves and dogs are closely related genetically. Some say that wolves and dogs are basically the same animal. In 1993 the Smithsonian Institution and the American Society of Mammologists, reclassified dogs from canis familiaris to canis lupis familiaris -- putting dogs under the same genetic umbrellas as the grey wolf. Wolf dogs are just like any other breed of dog, said Mr. Davis. Attacks are rare, he said, "even less so than for many breeds. We don't need the headlines" when this kind of attack occurs, said Mr. Davis, who owned wolf dogs since the late 1980s. They're called "wolf hybrids" in a report on the Web site of the Centers for Disease Control and Prevention. Slightly more than 300 people were killed by 403 dogs in the period from 1979-96, the report says. Fifteen wolf dog hybrids were involved in fatal attacks. Number one at 118 deaths was "pit bull types" both purebred and cross-bred; second was Rottweilers with 67 killings, third was mixed breed and fourth was German shepherds. Wolf dog hybrids came in ninth. Before her death, Ms. Piovesan was a caretaker, both by hobby and profession. She'd worked for five years at the Latrobe Regional Health and Rehabilitation Center, where she created programs -- bingo or arts and crafts -- for some 100 residents. She specialized in artwork, and encouraged residents to draw pictures or create dreamcatchers, a nod to her Native American heritage. Often, Ms. Piovesan attended a local flea market and purchased gifts for the residents. "She would bring them animated music boxes and organs -- things they could play with," said her supervisor, Connie Griswold. "We as an activity department don't have a lot of money to play with, but she would bring things for them." Ms. Piovesan shared little about herself, though. She mentioned an interest in exotic animals, but Ms. Griswold knew nothing about the wolf-dogs until she heard about her death. Aside from her animals, Ms. Piovesan lived alone. She'd lived in the same white house for many years -- maybe two decades, one longtime resident guessed -- but she separated from her husband and her daughter had grown up. Neighbors said that Ms. Piovesan received visitors only rarely. Family members knew something was wrong when Ms. Piovesan failed to show up for a breakfast meeting they'd arranged for Monday morning. A license from the Pennsylvania Game Commission is needed to own, breed and sell wolves and wolf-hybrids. Mrs. Piovesan did not have a license. The game commission was aware of her operation, but she had bought state dog licenses for the animals. "The difficulty is proving whether an animal is a dog or a wolf" or some mixture of the two, said Mel Schake, information and education officer at the game commission. There is no test that can determine that. Ms. Piovesan also had two Rottweilers, that were not in with the wolf-dogs and were not bred with them, said Westmoreland County Humane Officer Elaine Gower. Those dogs are well-cared for and well-behaved. She said family members do not want the dogs, so Action for Animals will take them in and find new homes for them. 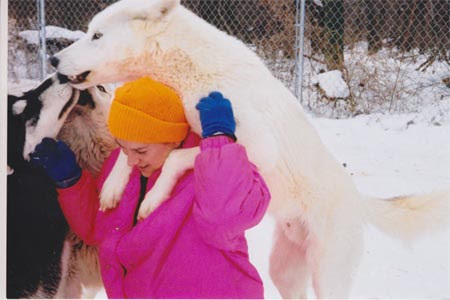 Ms. Piovesan treated her wolves like children, and said as much when neighbors asked about them. 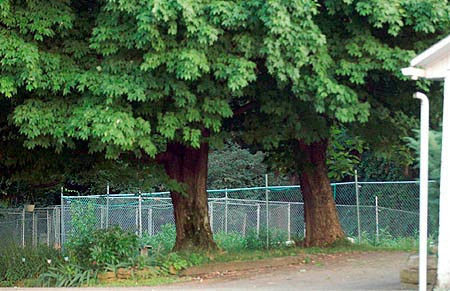 The fenced area in her backyard is about the width of a three-lane road, running the length of her house. The area was divided into sections: one for the wolf-dogs, one for her pair of Rottweilers, another for wolf puppies, with whom she'd play and romp. Ms. Piovesan provided the wolf-dogs with toys -- a replica igloo, balls, a plastic playhouse. Ed Gieselman, owner of a interior design business across the street, asked her recently about her attachment to the animals. Ms. Piovesan said, in response, that "they give me unqualified love," Mr. Gieselman recalled. She fed the animals road kill that sometimes caused the nearby neighborhood to smell. She'd recently asked Mr. Gieselman to help retrieve a deer carcass from Route 22, running parallel to Croft Road, where she lived. Together, they loaded the deer into Ms. Piovesan's truck and hauled it to her yard. "She also had one wolf that lived in the house with her, Spirit," Mr. Gieselman said. "She'd raised Spirit from a puppy. And she kept that one in the house." Neighbors had complained about Mrs. Piovesan's pets, mostly for making too much noise, and Officer Gower had investigated. She can file charges if animals are abused or neglected, and she never found any of those types of violations. "The enclosure was big for dogs but in my opinion, small for wolves," Officer Gower said. Officer Gower said she visited Ms. Piovesan's home about 10 times in the last 31/2years. Her home was decorated with Native American artwork, Officer Gower said. "She was pretty much on guard with me, because she knew that I knew that this wasn't a great situation," Officer Gower said. "She said she liked the [wolf-dogs] because they were pretty. Why she would want them as pets, that's beyond me." PENNSYLVANIA -- The body of a Westmoreland County woman was found mauled inside a pen where she kept a pack of nine hybrid wolves, but authorities were awaiting results of an autopsy to determine whether she was killed by the animals or died of an illness. The body of Sandra Piovesan, 50, of Salem (a town about 30 miles east of Pittsburgh), was found inside the 40-foot by 150-foot enclosure she kept in her backyard, where she raised the nine part-wolf and part-dog canines. Mrs. Piovesan's body was intact but had been partially eaten. Mrs. Piovesan's daughter suspected something was wrong when her mother failed to show up for a 10 a.m. meeting with her Monday, state police said. 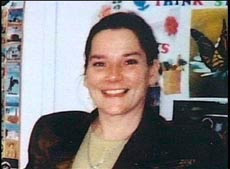 Her daughter then contacted her father, who went to the home and found Mrs. Piovesan's body in the enclosure. Mrs. Piovesan lived alone and was last seen Sunday night, police said. The Westmoreland County corner's office would not say if she had a separate medical condition that could have caused her to pass out in the enclosure. The state police and the Westmoreland County Humane Society went to the home yesterday and euthanized all of the animals. Humane officers shot the animals with darts that injected a serum into the dogs that killed them. Mrs. Piovesan also had two Rottweilers, which were not euthanized and were taken to the humane society. Most of the hybrid-canines weighed about 70 to 100 pounds and some were 7 to 8 years old. None of the animals was neutered or spayed and the animals had produced several litters of pups, humane officers said. There was some debate last night between agencies over what Mrs. Piovesan had done with the puppies. Humane officers said they would have to also destroy the animals' offspring since the parents had eaten and possibly attacked a human. They said they knew the animals had several litters, but they did not know who had bought or received the puppies from Mrs. Piovesan. Humane officers also did not know how many dogs Mrs. Piovesan had in the yard. After they put down seven of the animals earlier in the day they found two wolves roaming the enclosure. Police called for a front-end loader last night to remove a metal shed, believing a wolf den may be underneath it. They did not find anything under the shed, police said. Elaine Gower, a humane officer with Action for Animals and the Westmoreland County Humane Society, said she had been to the home several times over the last four years after several neighbors complained about the animals, mostly about noise. Last summer, Mrs. Gower was called to the home after the pack killed a female wolf. She said the animals tend to get agitated in the summer, which is mating season. Mrs. Gower said she was called to the home once after receiving reports that a friend of Mrs. Piovesan had been bitten by one of the animals. She said the bite report was never confirmed. Mrs. Gower said all of the animals were healthy. She said Mrs. Piovesan would feed them road-kill, beef and any scraps of meat she could find. "My biggest fear was that they were going to get out," said Mrs. Gower. "Wolves run away from people out of fear. Breeding them with dogs takes the fear out of them, which can make them more dangerous." Mrs. Gower said Mrs. Piovesan had all of the animals licensed as dogs to avoid a showdown with the Pennsylvania Game Commission. According to the commission's Web site, there are 35 licensed facilities that are permitted to either possess, breed and sell wolves and wolf-hybrids in Pennsylvania. Mrs. Piovesan's was not among the 35 facilities. People who have wolves or wolf-hybrids must comply with their local municipality's caging, public safety and record-keeping requirements, the Web site said. Mrs. Gower said the animals may have grown aggressive because they were limited to a small plot of land. She said a pack of that size would need 50 to 100 square miles to roam. Ed Gieselman, the owner of Elegant Interiors, a store across the road from the home, said he never had problems with the dogs and would often see Mrs. Piovesan outside with the animals. He said she also kept one inside the home with her. "She liked the fact that they gave her unqualified love and didn't ask for anything in return," Mr. Gieselman said. "The animals never did anything to anybody." Mrs. Gower said Mrs. Piovesan fancied Native American themes, which translated into her love for wolves. She said most of the complaints she received were about the animals howling at night. OHIO -- Deputies in Jefferson Township said a gas meter reader was attacked and bitten by a pit bull Tuesday. Gas meter reader Neil Young tried to avoid being bitten in the leg by the dog, but couldn't. Deputies said a pit bull attacked Young as he was trying to read a gas meter in the back yard of a home on Clovis Court. They said the dog made his way under a fence. Young said he ran into a nearby garage and then used his cell phone to call for help. Authorities said a deputy arrived at the scene, but the dog charged at him, too, forcing the deputy to kill the dog. Animal control officers took the dog away, and said pit bulls are deemed vicious in the state of Ohio, but that any dog can become a danger. Investigators said Young is OK, but the dog’s owner could face charges. GEORGIA -- After an anonymous phone call, Upson County Animal Control responded to a severe case of animal hoarding and neglect. In the morning hours of June 28, Animal Control Manager Smart Web visited the residence of Ricky McKinley and Donna Lynn Tankersly on Birdsong Road to investigate an animal cruelty complaint. A veterinarian and his assistant were on the scene as witnesses in part, but also to examine and record the health and physical condition of the animals. Upson County Sheriff's Deputy Marie McDaniel and Sergeant David Walker were present and bore witness as well. Web says that Tankersly called the shelter after finding out she had been reported. She warned officers not to come to her house and said that she wasn't giving her animals up. Only after meeting her, did they see just how serious she was. According to Web, Tankersly's demeanor upon their arrival was less than welcoming. Web stated that she continued to act defensive until Sgt. Walker stepped in to explain the situation more thoroughly, and after a moment, she agreed to let the small group come into the house to see the place they were sharing with these animals. After entering the double-wide trailer, it immediately became apparent to Web that there were too many cats and not enough space, and that their living conditions were highly unsanitary and unhealthy. 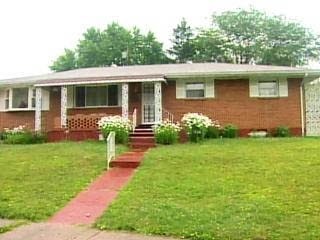 There were, not only upwards of 30 cats and kittens living there, but three medium breed dogs as well. Once inside, Web and the others could see fresh and dried animal feces all over the floor of the first room and in the corners of others, along with contaminated cat food and litter. It was reported that a toilet with the lid lifted was the only source of water for the animals. One kitten was even found to have an eye infection that had gone untreated for some time. This isn't the first time Tankersly had been warned about the number of animals in the house. McKinley says they've argued about this countless times over the past few years. The couple has been together for ten years and not until the last five have there been issues about the pets she keeps. Tankersly was transported to the Upson County Sheriff's Office and charged with cruelty to animals. Over 20 cats were captured from the residence, and several traps were set to catch the remainder. Tankersly could not be reached for comment. GEORGIA -- Three pit bull dogs were impounded Wednesday after they escaped a backyard and then attacked and injured three men in Duluth. Police received reports of three separate pit bull attacks at 7:34 a.m. Wednesday in a residential area near 1973 N. Executive Drive in Duluth. The victims were either leaving their houses or walking in the area when they were bitten by the dogs. All three men suffered minor puncture and laceration wounds, mainly to their lower bodies, said Cpl. Darren Moloney, spokesman for the Gwinnett County Police Department. The victims were identified as Jean Chi, 59, Chu Insoo, 48, and Manuel Larz-Mujira, 42, all of Duluth. They were all taken to Gwinnett Medical Center with non life-threatening injuries, Moloney said. By the time officers arrived and tracked down the owner, 33-year-old Brian A. Jones of Duluth, the dogs had been confined once again to his house, according to an Animal Control report. Jones reportedly said the dogs are usually kept in his fenced-in backyard. However upon inspection, one of the back gates was found to be open, Moloney said. The dogs were impounded by Gwinnett County Animal Control. "I don't know if they will quarantine them for a few days," Moloney said. "They are not going to be automatically put down. It depends on the severity of the attack and if they've done it before." The dogs were being evaluated at the Gwinnett County Animal Shelter at press time Wednesday. Jones was issued six citations on three counts of animal attacking without provocation and three counts of having an unrestrained animal.